Editor-in-Chief, Dr. Gregory Ciottone, and Associate Editors, Dr. Philip D. Anderson, Dr. Erik Auf Der Heide, Dr. Robert G. Darling, Dr. Irving Jacoby, Dr. Eric Noji, and Dr. Selim Suner, recognized worldwide as authorities in the field, bring you this brand-new reference, which offers comprehensive yet succinct guidance on the preparation, assessment, and management of a full range of disasters, both natural and man-made (including terrorist attacks and the threat of biological warfare). More than 200 contributors carefully outline the basics of disaster management and provide guidance on more than 100 specific disaster situations. Part 1 offers an A to Z source for information on every aspect of disaster medicine and management. Part 2 features an exhaustive compilation of every conceivable disaster event, organized to facilitate fast reference in a real-time setting. The second part of the book also serves as a quick consult on disaster medicine. Presents a full range of coverage from the basics of disaster medicine to more advanced concepts, such as tactical EMS, hazard vulnerability analysis, impact of disaster on children, and more. Discusses identification of risks, planning of organization and equipment, and education and training. 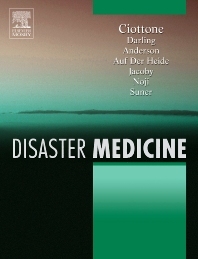 Includes individual Concepts and Events sections that provide information on the general approach to disaster medicine and practical information on specific disasters. Offers comprehensive coverage of natural disasters, accidental disasters, transportation disasters, and intentional events. Includes an exhaustive list of chapters on the conceivable chemical and biologic weapons known today. Features a practical chapter organization throughout that covers description of event, pre-incident considerations, post-incident considerations, medical treatment of casualties, unique considerations, pitfalls, case presentations, and suggested reading. Discusses the management of future events, or possible scenarios, for which there is no precedent. 15. International Disaster Response, Dan Hanfling, Craig H. Llewellyn, and Frederick M. Burkle, Jr.
37. Surveillance, P. Gregg Greenough and Frederick M. Burkle, Jr.
42. EMS Behind the Barricade, Louis N. Molino, Sr.
51. Practical Applications of Disaster Epidemiology, P. Gregg Greenough and Frederick M. Burkle, Jr.